Below you can read a recent interview that Jonathan did with the Irish Examiner. 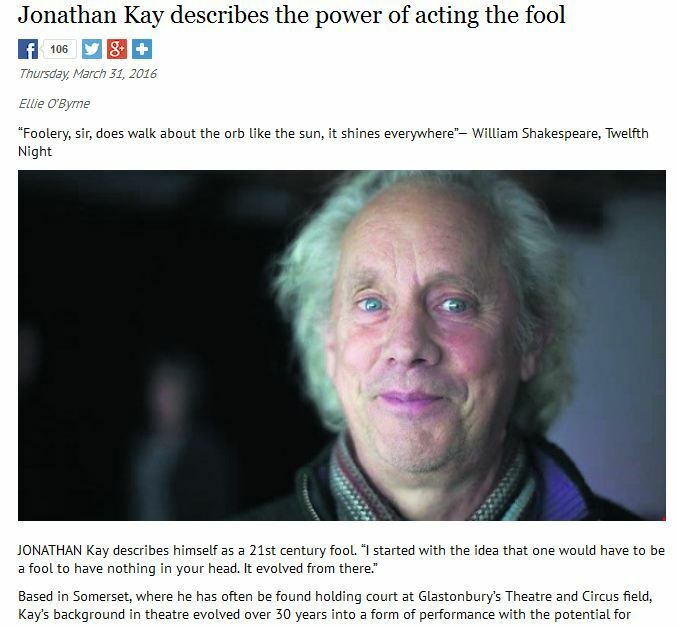 Based in Somerset, where he has often be found holding court at Glastonbury’s Theatre and Circus field, Kay’s background in theatre evolved over 30 years into a form of performance with the potential for profound effect on modern audiences; Kay takes the stage for improvised interactions that are part theatre and part a return to the medieval court. No-one is safe from his fool’s gaze, and yet audiences respond warmly, inviting intimacy and shared mirth. The figure of the court jester or fool has captured human imagination in European, Indian, and Chinese lore since long before Shakespeare’s time. Part actors, part comedians, and part soothsayers, their insights and pratfalls have made people laugh at human folly, shining a light deep into the recesses of our egos. The therapeutic and occasionally subversive power of laughter is well-documented. April Fool’s Day itself may have its origins as a form of protest against the Edict of Roussillon, a proclamation by the French King that New Year’s Day was to be celebrated on January 1; in 16th century France the new year was celebrated for a week from March 25, culminating in a feast on the first of April. Charles IX’s ruling may have given rise to the “Poisson d’Avril” (the “fish of April”): A day of protest in the form of nonsensical acts. At the core of Kay’s work is getting his audience to recognise the fool in all of us, part of the condition of human duality, he says. Everybody contains within them the characters of both the king and the fool. Having spent 30 years developing a structure of fooling, Kay gives workshops that have been used by actors, directors, and theatre developers as a way of unlocking creativity and dispelling fear in performance. “The fool doesn’t have judgement and he’s not a spy; he plays the fool for the intimate quality, to explore humanity and what strange paradoxes we get ourselves into,” says Kay.